1. Preheat oven to 425 F. Thoroughly wash and dry the potato. Pierce the skin of the potato a few times with a fork. This helps the interior cook. 2. Rub the exterior of the potato with oil and sprinkle with salt. Place on a baking sheet. 3. Bake at 425 F for 1 hour or until soft throughout. 4. Ten minutes before the potato is to come out of the oven, begin to prepare your filling. Melt the vegetarian butter spread in a small skillet over medium heat. Add the carrot, onion, and mushroom to the pan. Sprinkle with salt and pepper. Saute for 5 minutes, stirring occasionally. Add the spinach and allow it to wilt. Remove skillet from the heat. 5. Once the potato is cooked throughout, remove pan from the oven. Carefully slice the potato lengthwise, down the middle and squeeze the ends to fluff the interior. 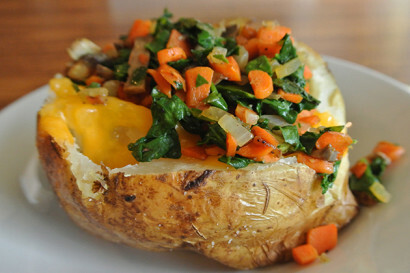 Tear the slice of cheddar cheese into small pieces and lay them inside the potato. Place pan back in the oven for 3 minutes. 6. Remove from the oven and place on the serving plate. Fill the interior with the vegetable mixture and enjoy!